Select from our STL’s and start creating the gaming table of your dreams. Welcome to Infinite Dimensions Games. 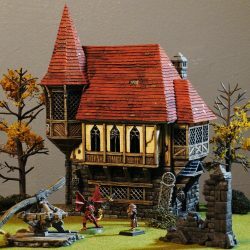 We are a professional, designer/gamer owned and operated company specializing in creating premium quality 3D printable scenery for tabletop roleplaying and miniature games. Our mission is to bring your gaming table to life. Buy and download our STL files from our online store to print the models yourself, or have them printed and shipped to you by visiting one of our licensed printing partners. Looking to buy a 3D Printer? Check out our recommended printers here. Love our Terrain but don’t have a 3D Printer? Never fear, you can buy them pre-printed here! 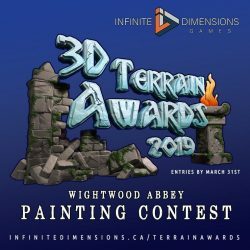 Voting for the Wightwood Abbey Painting Contest has now closed and Dennis Haas is the winner of the popular vote with his entry “Abbey_Bear”. You can still check out all the entries and admire your favourites. Thank you everyone for your wonderful submissions. Stay tuned for the final judging results and announcement of winners soon! Our vision of tabletop terrain is one of form as well as function. We want our gaming pieces to be able to fit equally into a historical setting as well as one of fantasy. For that reason, we’ve tried to keep true to examples of historical building methods and yet add enough of our own aesthetic to make them unique and full of character making them usable in both your fantasy and your historical games. Each building has removable floors and rooftops and can be opened up to reveal a fully modelled playable interior. Buildings separate at just the right height for internal gaming to be obstruction free, and our peg system allows for easy separation and reattachment of sections. 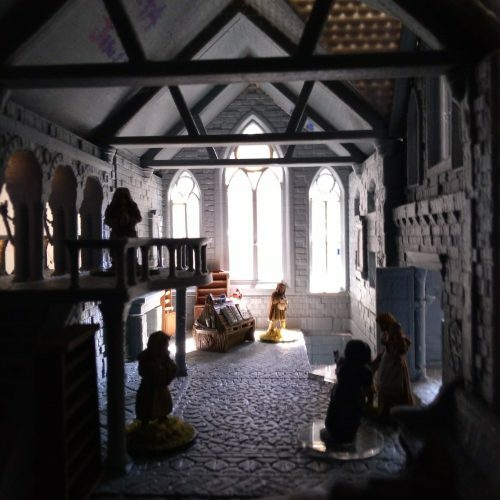 As well, passageways and floor areas have been modelled to accommodate standard 1” bases, so you’ve always got enough space to move your figures about. Our .stl files are scaled to print at a 28mm tabletop standard (for ease of use with most roleplaying and tabletop miniature games) and are supplied as such. However, we have also made sure that models scaled to ½ size also print properly and can be incorporated into any 15mm historical wargame. Our 3D printable terrain is designed for standard 8″x8″ (203mm x 203mm) printer bed with minimal need for support material. We’ve carefully tested wall thickness, overhangs, potential bridging issues and other 3D printing pitfalls and have incorporated the most efficient way to print each part (given the variation of printers out there) into our final .stl files. All of our 3D printable terrain comes with free campaign material as well as a selection of scenarios for tabletop roleplaying and skirmish games. All the interiors of our models are meticulously detailed. So your scenery is just as beautiful on the inside as on the out. 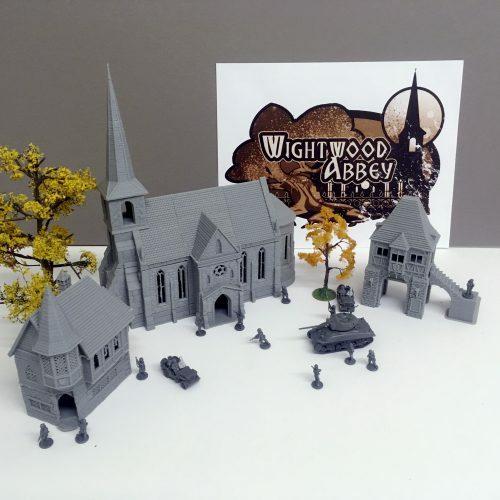 All the models in the Wightwood Abbey set come with fully functioning, obstruction free doors that are printed separately and pinned into place with a piece of 1.75mm 3D Printer Filament. The doors swing open to allow your 1” based miniatures access into the interior.